Health & Revigorating Therapies - OrhideeaSpa. Balinese massage with bamboo sticks is a combination of Balinese techniques and techniques made with bamboo sticks. They work ( on energy meridians) with delicate from the joints through manipulations, flexions extensions. Sports exercise bring an energetic flow to the whole body and give vitality to the body. Forget the pills and fiber drinks! Use a colon massage to stimulate colon motility and remove the pain and discomfort caused by slow bowel movements, constipation, bloating. By engaging the abdominal muscles and chest massage, this medical massage helps to improve breathing, circulation and remove excess tissue fluid in the abdominal area. The abdomen is a sensitive area and “very personal” and therefore treatment is delivered with the utmost care, attention and respect. A therapy with medicinal plants bags originates from the traditional Thai medicine and induces a profund state of relaxation. This therapy made consists of movements and massage technics with the medicinal plants bags which are warmed in steam bath. The anticellulite massage reacts directly upon the superficial layers of the body, by stimulating the elasticity of the skin and of the hypodermic tissues activating the blood circulation an improving the aspect of the skin. Are you following a detoxifying, slimming or anti-cellulite treatment ? Are you pregnant or being in a post-surgery recovery? Do you suffer of poor blood circulation or water retention? Manual lymphatic drainage remove excess of water and toxins from the tissues and consequently, the discomfort caused by them. This therapy has beneficial effects on the entire body, helping to strengthen immune system, as well. Tired or having muscle and joints pain? Enjoy this 3 in 1 treatment that combines the benefits of hand massage with warm –cold showers and volcanic aromatic moor application. Stop to back pains! A fast and efficient remedy consisting of a complex of procedures. Get back your energy! A fully hammam treatment that combines exfoliation process with alternative hot and cold rinses. Let your body cheered by a tropical rain! This wet therapy combines the herbal scrub benefits with the relaxing Vichy shower to purify, detoxify, soothe and soften the skin. 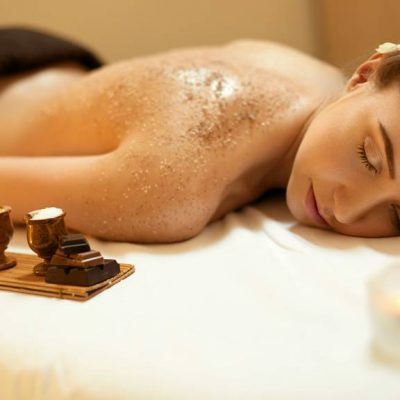 A holistic treatment recuperation of the skin health. An elixir of health... This manual lymphatic drainage followed by applying a body & face honey mask that favor mobilization and elimination of harmful waste from the body. Chocolate through al your pores! 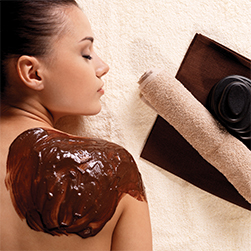 A pampering experience consisting of a full body exfoliation, continued with a pure chocolate wrap, which detoxifies. Is your skin sensitive, dry, irritated or sunburned? Enjoy this cleansing and purifying body treatment made with a creamy herbal scrub! A healthy and vitalizing cocktail, in one corporal treatment for the hydration and recovery of the skin's elasticity.